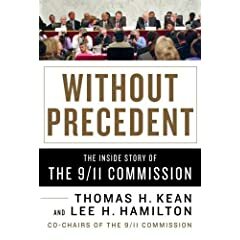 Many Americans are content with the 9/11 Commission Report, but the two chairmen of the commission, Thomas Kean and Lee Hamilton are not. The only information the commission was permitted to have about what was learned from interrogations of alleged plot ringleaders, such as Khalid Sheikh Mohammed, came from “thirdhand” sources. The commission was not permitted to question the alleged plotters in custody or even to meet with those who interrogated the alleged plotters. Is the torture issue a red herring? The 9/11 Commission was not tasked with investigating interrogation methods or detainee treatment. The commission was tasked with investigating al Qaeda’s participation in the 9/11 attack and determining the perpetrators of the terrorist event. There was no reason to withhold from the commission video evidence of confessions implicating al Qaeda and Osama bin Laden. Was the video evidence withheld from the 9/11 Commission because the alleged participants in the plot did not confess, did not implicate al Qaeda, and did not implicate bin Laden? Did the Bush administration cleverly take advantage of the torture claims in order to spin the destruction of the CIA video tapes as a “torture story.” It is conceivable that the tapes were destroyed because they reveal the absence of confession to the plot. As Kean and Hamilton ask, without evidence how do we know the truth? All we have is the word of the administration that told us Saddam Hussein had weapons of mass destruction and that, while sitting on a NIE report that concluded that Iran had terminated its weapons program in 2003, told us that Iran had an ongoing nuclear weapons program and was close to having a nuclear weapon.